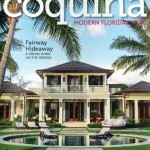 We are Featured in Coquina Magazine! 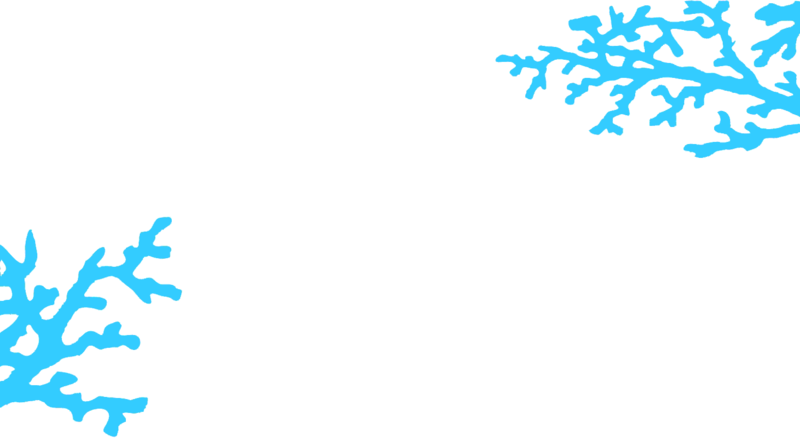 Check us out on page 24. Modern design doesn’t get much love in this part of South Florida. From McMansions to strip shopping centers, the arches and columns of Mediterranean Revival reign supreme. “It had great bones; it’s just a wonderful space,” said Silberstein. But there was one problem: Every room needed to be repurposed, so the main living areas faced nature instead of the street. So, the living room became the master bedroom. The master bedroom became the living room. A former carport became a kitchen. And the old kitchen became the hot-pink-and-turquoise lair of the couple’s 9-year-old daughter, Ava. “It’s my dream bedroom,” Ava said, showing off its array of happy colors and peppy fabrics. “We wanted to respect the past but make it clean and modern for the way we live,” said Devlin. The renovation stayed within the home’s original footprint, except for the addition of an outdoor Florida room with built-in bar, decorated with vintage porch furniture from Baldassari’s grandparents. The house demonstrates the high style quotient of dozens of gallons of white paint slathered on brick walls, beamed ceilings, roof and exterior walls. Suddenly, what seemed old and gray is happy and bright. Sticking to all-white makes the small house seem larger and ramps up its modernist sensibilities. Several pieces of furniture left by previous owners were painted and reupholstered, with the help of West Palm Beach interior designer Jacki Mallick. 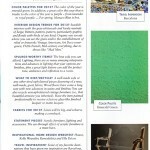 We Are Featured in Palm Beach Illustrated! 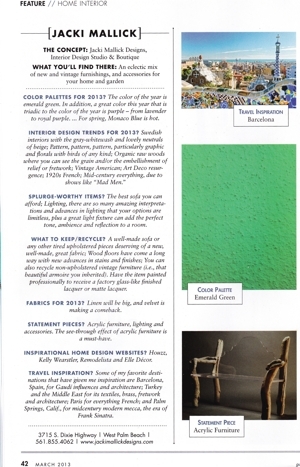 Check us out on page 106 of Palm Beach Illustrated’s October 2014 issue. Click here to view the article! 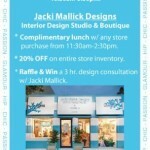 Jacki Mallick’s Designs shop at 3715 S. Dixie Highway has a great new storefront that you aren’t likely to miss as you pass by. It is painted in wide, horizontal stripes of cerulean blue and white. I recently stopped by Jacki’s atelier for a look at her merchandise, which included a lovely selection of vintage mirrors that evoked Hollywood glamour of the 1940s. There also were some original Slim Aarons photographs of yesterday’s Palm Beach on the walls, beautifully framed and ready to remind today’s Palm Beachers of the days gone by. I knew Slim Aarons and always enjoyed the photographs he took of the kings of Hollywood, including Clark, Gary and Jimmy — their last names, as if you needed them, were Gable, Cooper and Stewart. 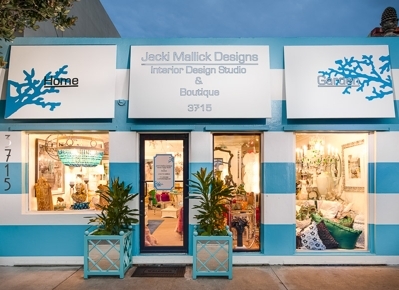 When you stop by Jacki’s shop, don’t miss the yard in the rear, where she has assembled a great variety of furnishings for the pool or the patio, from end tables to pool deck chairs and, of course, glamorous chaises. You’re likely to meet Jackie and she will be, as always, glamorously attired to greet her guests.